Peter Sagal: Host of NPR's "Wait Wait... Don't Tell Me!" If you are out Sunday cheering on the more than 11,000 runners in the Twin Cities Marathon, be on the lookout for Peter Sagal, host of NPR's quiz show "Wait Wait ... Don't Tell Me!" This will be Sagal's 11th marathon and his first in the Twin Cities. He said he's hoping to finish in under three and a half hours. Sagal said he'll stand out in the crowd of skinny-leg runners. "Look for an increasingly desperate and sweaty short bald guy with somewhat thick legs and a shuffle-y gait," he said. Sagal started running when he turned 40, fearing death was around the corner. "It was kind of a classic midlife crisis thing," he said. "All of the sudden you're struck by your own imminent mortality... I said to myself, 'I know, if I run a marathon, I won't die.'" He ran his first marathon in Chicago in 2005. "It was extremely painful; I didn't train correctly or all that well, but I finished it in a little over four hours," Sagal said. "Then a funny thing happened, which I did not expect. I expected to do it, say 'I've done that, now I shall decline gracefully into my middle years' or maybe I'd go hiking in Nepal or something else that people like me do. But instead I said to myself, 'I wonder if I can do that faster.'" 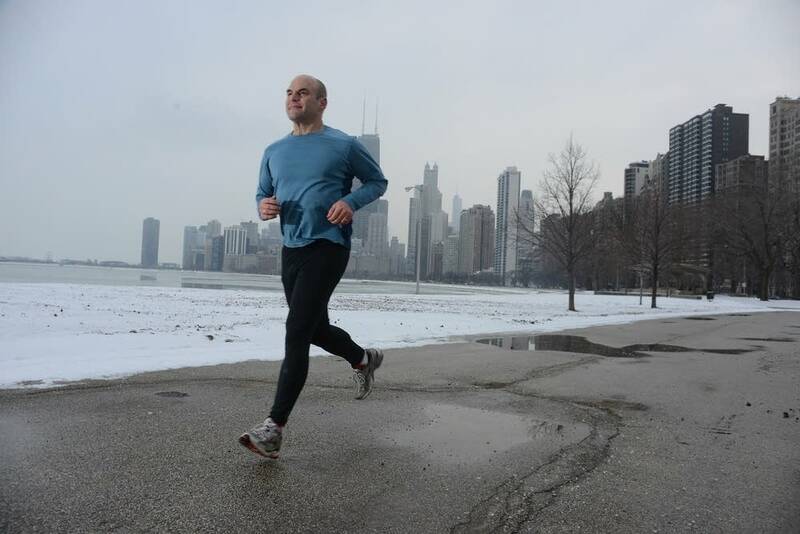 By the next year's Chicago Marathon, he had shaved 40 minutes off his time. He now writes about running for Runner's World. Sagal said he often thinks about the jobs most Americans do: What he describes as sitting in front of a computer manipulating symbols. "I think that it's really important for us to do something with our bodies," he said. "I really do. I think you need to be physically active, not just for your health, which is important, but for your mind. I think we all need to get the heck out and move... There's something about running that is so primal and so easy, it's accessible to everyone."